The G300a thermal imaging camera from FLIR Systems lets you can monitor vital gas pipelines or installations 24/7. Installing a FLIR G300a will immediately enable you to see if a dangerous and costly gas leak appears. You do not have to rely anymore on periodic inspections. Monitoring is done from a safe distance without the need to send technicians into potentially dangerous areas. Based upon a cooled Indium Antimonide (InSb) detector - the FLIR G300a provides the sensitivity to detect even small leaks of detects of gases including Benzene, Ethanol, Ethyl benzene, Heptane, Hexane, Isoprene, Methanol, MEK, MIBK, Octane, Pentane, 1-Pentene, Toluene, Xylene, Butane, Ethane, Methane, Propane, Ethylene and Propylene. To ensure full compatibility with your process - FLIR G300a thermal imaging cameras can be easily integrated in application specific protective housings. Available with a choice of 23mm or 38mm lens, all FLIR G300a models are easy to control from a safe distance. They can be fully controlled over Ethernet and can easily be integrated in a TCP/ IP network. 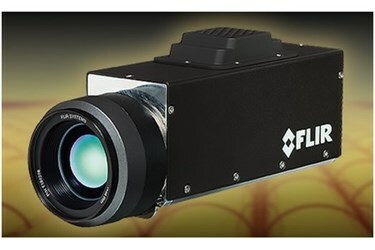 Optical gas imaging cameras from FLIR can visualize and pinpoint gas leaks without the need to shut down the operation. With an optical gas imaging camera it is easy to continuously scan installations that are in remote areas or in zones that are difficult to access. Continuous monitoring means that you will immediately see when a dangerous or costly gas leak appears so that immediate action can be taken.